I'm excited to share a tutorial with you today! If you saw yesterday's post, you know that I recently had fun coming up with some creative ideas for using washi tape. 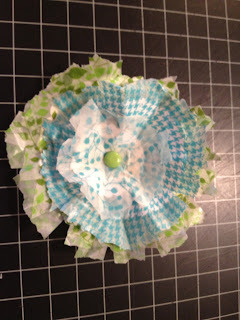 Of all the ideas, the layered flowers were my favorite so I wanted to share the "how to" steps with you today. 1. 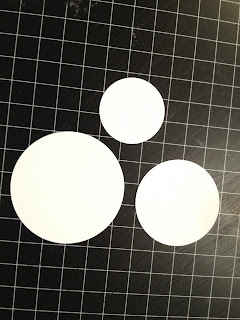 You will want to start with 3 different sized white card stock circles. I punched mine out, but you could also die-cut, or hand cut them. The sizes of my circles were 2.5", 2", and 1.5". The larger your circles, the larger your flower....the smaller your circles, the smaller your flower will be. In subsequent photos, my circles are scalloped...don't worry about this -- scalloped or plain is fine. 2. Your washi tape can be different colors and/or widths for each layer, or the tape can all be the same. I used at least 2 different colors of tape on my flowers because I wanted the layers to pop. 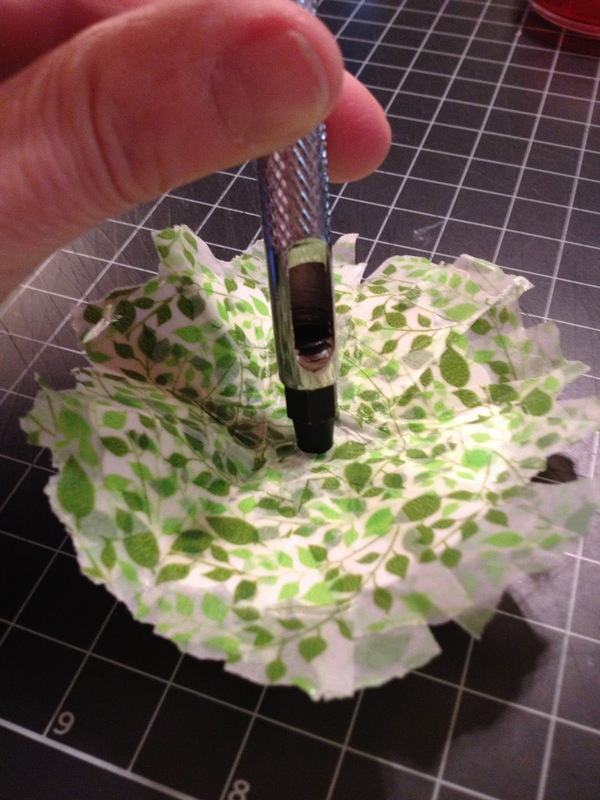 You will want to work on a craft mat or table surface so that your flowers can peel away from the surface easily. I don't recommend working with a piece of paper under your flower, as this will make it difficult to peel the flower up from the paper. 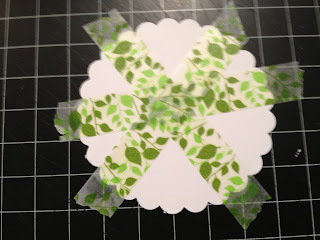 Start by adhering strips of washi tape on one side of a circle. You don't need to press the tape to the surface under your circle -- you will be lifting it off in a moment. Be sure that the tape strips are longer than the diameter of your circle, so that each one sticks out over the edges. 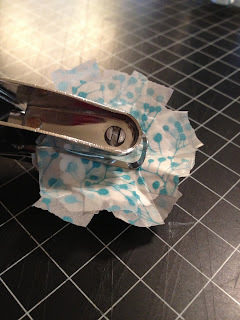 I chose to tear, rather than cut, my tape to give the flower a "ruffled" appearance. 3. Continue to add tape strips until the entire white circle is covered. 4. Carefully peel the circle up from your surface and flip it over to repeat the process on the other side. 5. 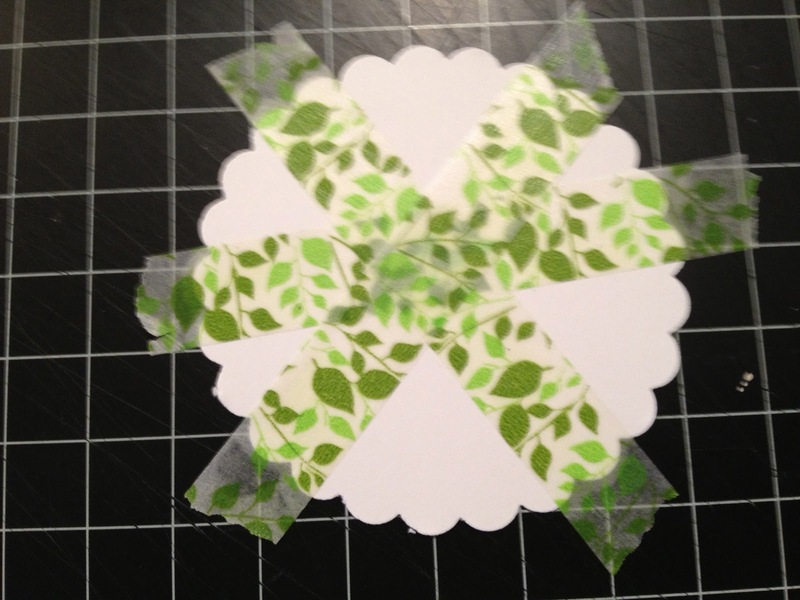 Once both sides of your circle are covered with washi tape strips, punch a tiny hole in the center of the circle. For smaller circles you can use a small 1/8" hole punch. For larger circles you can use a paper piercer or an "anywhere" hole punch. 6. Once your holes are punched, crumple the circle in your fingers, folding all of the sides up into a "cone" shape. 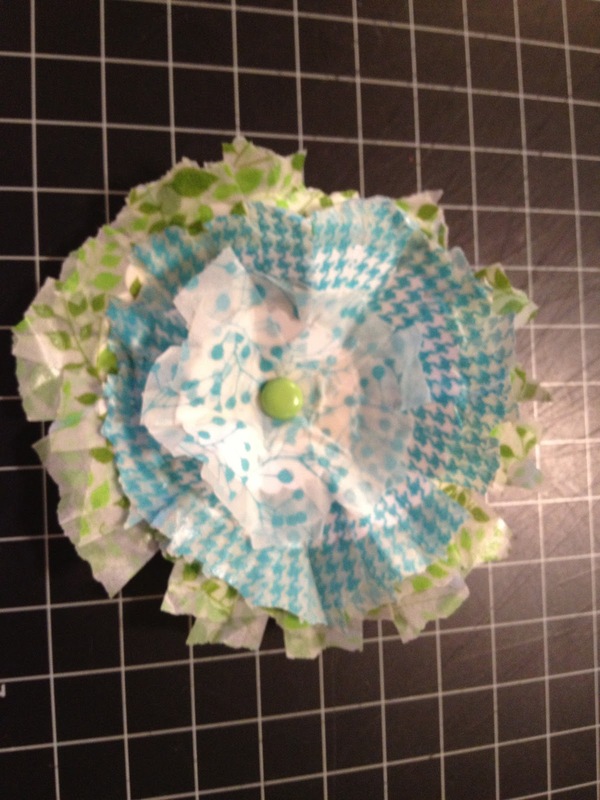 Without completely flattening your shape, pull the sides out slightly to create your first flower layer. 7. Repeat the steps above to create two more taped circles. Once complete, layer the three circles and attach a brad (find one with long "legs") through the holes in each layer. 8. Finally, you can leave the brad showing, or do what I did and add a colorful button and some twine over the brad. 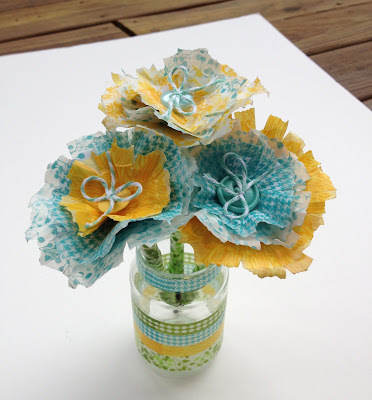 You can use these cute flowers on pages or cards, or hot glue them to the top of pens. Wrap washi tape around the pen to create a flower stem. Make several "flower pens" and add them to a cute recycled baby food jar (with washi tape stripes of course)! Thanks for stopping by! Leave me a comment and let me know how your flowers turn out! For the Record...the Cinch is pretty cool!